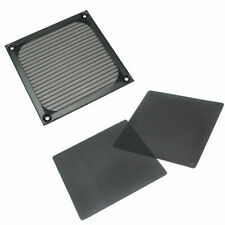 120mm Black Washable Fan Filter. Guard Grill and Black Fixing Screws. Note: The color of the item may vary slightly due to photography and your own computer Feature: Suitable for: for the home computer chassis fan dust, speaker speaker grilles and a variety of electrical and electronic products speakers dust protection. Help to keep your PC and PC components clean,minimize the noise from the fan and extend the life-span of your fan. Fits standard 80mm fans or cut for small size. When the fan in your PC blowing cool air inside a computer case, it can also take in dust and dirt. Specification: Material:Plastic and Sponge Color:Black Standard:80mm Dimension:86 x 86 x 10mm/3.39 x 3.39 x 0.39""(L x W x T) Weight:162g. A 3-year warranty is promised, your satisfying is our ultimate pursue. - Protects your internal components from dust and debris. 1 Piece 12cm Fan Filter. - Easy to clean, good ventilation effect,easy installation. 1 Piece 12cm Fan Filter. - Easy to clean, good ventilation effect,easy installation. - Protects your internal components from dust and debris. - Durable and practical. - Simple and elegant appearance. Aluminum Filter - Super durable and easy cleaning. - Wave-folded Design - Provides larger surface area for dust blocking. - Color: Black. Size: 80mm, 120mm. Removable front plate, back plate and middle filter, easy to wash. 8 x Screws. 5V 4 Channel Relay. Suitable for PC case fan. Black L2 R2 Trigger. We strive to provide the best deals to you and help you make your project successful. Practical and useful computer accessory. Can be helpful in keeping your computer components clean. Can protect you computer from overheating. Size: Approx. We want to make sure you are happy with our item. Size: Approx 120mm 120mm 2mm. - Aluminum Filter - Super durable and easy cleaning. - Wave-folded Design - Provides larger surface area for dust blocking. Specification: - Color: Black. Protects your internal components from dust and debris. 1 Piece 12cm Fan Filter. - Easy to clean, good ventilation effect,easy installation. - Simple and elegant appearance. Size: Approx 120mm 120mm 2mm/4.72" x 4.72" x 0.08". - Material: Aluminium Alloy. - Aluminum Filter - Super durable and easy cleaning. - Wave-folded Design - Provides larger surface area for dust blocking. Material: Aluminium Alloy. - Aluminum Filter - Super durable and easy cleaning. - Wave-folded Design - Provides larger surface area for dust blocking. - Color: Black. Note: The color of the item may vary slightly due to photography and your own computer Feature: Suitable for: for the home computer chassis fan dust, speaker speaker grilles and a variety of electrical and electronic products speakers dust protection. Help to keep your PC and PC components clean,minimize the noise from the fan and extend the life-span of your fan. Fits standard 60mm fans or cut for small size. When the fan in your PC blowing cool air inside a computer case, it can also take in dust and dirt. Specification: Material:Plastic and Sponge Color:Black Standerd:60mm Dimension:64 x 64 x 7mm/2.52 x 2.52 x 0.28""(L x W x T) Weight:58g. 2 Pieces 12cm Fan Filter. - Easy to clean, good ventilation effect,easy installation. - Simple and elegant appearance. Size: Approx 120mm 120mm 2mm. Aluminum Alloy Fan Filter Dust Guard Cover for PC Case Fan Black 120mm Was£2.16 x 2 Price:£1.62 x 2. - Aluminum Filter - Super durable and easy cleaning. - Wave-folded Design - Provides larger surface area for dust blocking. 1X Fan guard. Mounting hole center to center distance: Approx. Whole size: Approx. Wave-folded design, provides larger surface area for dust blocking. A great accessory for your PC, computer. Color: Black. A 3-year warranty is promised, your satisfying is our ultimate pursue. - Protects your internal components from dust and debris. 2 Pieces 12cm Fan Filter. - Easy to clean, good ventilation effect,easy installation. Size: Approx 80mm 80mm 2mm. - Aluminum Filter - Super durable and easy cleaning. - Wave-folded Design - Provides larger surface area for dust blocking. Specification: - Color: Black. A 3-year warranty is promised, your satisfying is our ultimate pursue. - Material: Aluminium Alloy. - Aluminum Filter - Super durable and easy cleaning. - Wave-folded Design - Provides larger surface area for dust blocking. Material: PVC. Practical and useful computer accessory. Can be helpful in keeping your computer components clean. Can protect you computer from overheating. Size: Approx. Color: Black. We want to make sure you are happy with our item. Size：120mm x 120mm or 80mm x 80mm. Help to keep your PC and PC components clean, minimize the noise from the fan and extend the life-span of your fan. 5V 4 Channel Relay. When the fan in your PC blowing cool air inside a computer case, it can also take in dust and dirt. 1X Fan guard. A great accessory for your PC, computer. Mounting hole center to center distance: Approx. Wave-folded design, provides larger surface area for dust blocking. Material: Iron wire. We want to make sure you are happy with our item. Size: Approx 120mm 120mm 2mm. 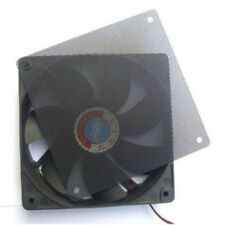 Aluminum Alloy Fan Filter Dust Guard Cover for PC Case Fan Black 120mm Was£2.16 x 2 Price:£1.71 x 2. A 3-year warranty is promised, your satisfying is our ultimate pursue. 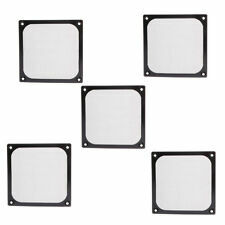 12x12cm PC Computer Cooling Fan Guard Black Wire Dustproof Cover Dust Filter. 1X Fan guard. Mounting hole center to center distance: Approx. Wave-folded design, provides larger surface area for dust blocking. A 3-year warranty is promised, your satisfying is our ultimate pursue. - Protects your internal components from dust and debris. 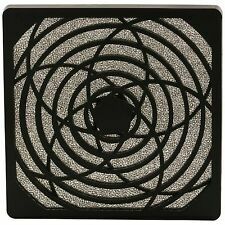 1 Piece 20cm Fan Filter. - Easy to clean, good ventilation effect,easy installation. 1X Fan guard. Mounting hole center to center distance: Approx. A great accessory for your PC, computer. Wave-folded design, provides larger surface area for dust blocking. Material: Iron wire. Color: Black. 1 Piece 12cm Fan Filter. - Easy to clean, good ventilation effect,easy installation. - Simple and elegant appearance. Size: Approx 80mm 80mm 2mm. - Aluminum Filter - Super durable and easy cleaning. - Wave-folded Design - Provides larger surface area for dust blocking. Good quality! Excellent Service! Specification: - Color: Black. 1 x 12cm Fan Filter. - Easy to clean, good ventilation effect,easy installation. - Simple and elegant appearance. Good quality! Excellent Service!